You are currently browsing the tag archive for the ‘recipes made in cupcake tin’ tag. Today I want to feature a great, easy and gluten-free recipe. I have been baking and sharing those recipes a lot so I decided I needed to mix it up a bit. 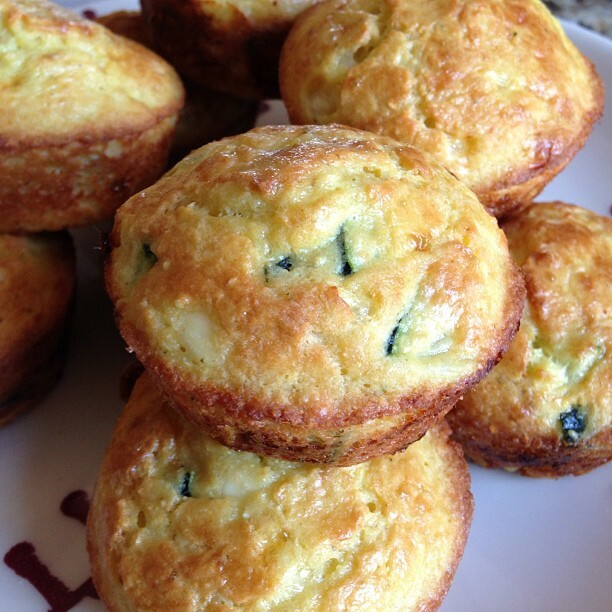 So today I want to share this easy breakfast muffin. Every Sunday I make up my husbands breakfast for the week. This way he just grabs it every morning as he is heading out the door. Plus, I know he is eating the most important meal of the day 🙂 It needs to be easy so he can reheat the breakfast when he gets to his office. He loves eggs so I try to stick with recipes with eggs. His favorite recipe is the Ham and Mushroom Scrambled Egg Cups. Almond flour and quinoa flakes are the two ingredients that replace traditional flour in this recipe, and also make these very nutritionally dense muffins. You can find both ingredients at Whole Foods but I actually found the almond flour at Walmart. The texture of the breakfast muffin reminds me of the texture of a corn muffin which I love! Recipe yields about 12 breakfast muffins. My batch made 11 muffins. Adapted by Kalyn’s Kitchen. Cut stem and blossom end off zucchini, then cut in fourths lengthwise. Then on each strip, cut off part of the white center part of zucchini, so you have zucchini strips with skin and about 1/4 inch of white. Cut into thinner strips if needed, then dice to make small cubes around 1/4 inch square. Heat olive oil in non-stick frying pan and saute zucchini until it’s softened and just starting to brown, about 5 minutes. In large plastic bowl, combine cooked zucchini, cottage cheese, Parmesan, quinoa flakes, almond meal, baking powder, beaten eggs, water, crumbled feta, green onions, and Spike seasoning if using. Gently mix together with large spoon. Spray silicone muffin pan or individual silicone muffin cups with non-stick spray or olive oil. Divide the mixture between 12 muffin cups. Bake muffins about 25 minutes at 400 degrees until muffins feel firm and are lightly browned. These will stay good in the refrigerator for quite a few days and can be reheated in the microwave. Be careful not to overcook when reheating or they will be too hard.